Out of all the luxury midsize SUVs that we know about at the moment for 2014, Lexus RX 350 F Sport is only outclassed by the 2014 Land Rover Range Rover Sport, while being at around the same level as the Acura 2014 MDX. When referring to luxury SUVs and crossover SUVs, we can safely say that Lexus manages to dominate the market. The Lexus 2014 RX 350 F Sport does not offer the best performance in this class but the luxurious cabin makes it up with really ample cargo space and roomy back seats. We are looking at an SUV that always has positive reviews and comes on the market with a really good price tag ($39,000 to $47,000) and impressive long-term ownership cost. Lexus 2014 RX 350 F Sport manages to accelerate without much effort although it is not as swift as some may want to see. The engine behind the hood is V6 and we have an 8 speed automatic transmission that is utilized as standard. The regular RX has 6 speed automatic gearbox as standard. The estimated fuel consumption is of 18 on the highway and 25 in the city. This is really good for the class. While Lexus 2014 RX does not stand out as being too athletic, we are faced with a really comfortable ride. The Lexus 2014 RX 350 F Sport comes with better handling but firmness may be something you do not like. At the moment we see many discrepancies between Lexus 2014 RX 350 F Sport reviews and that is totally normal. This is one SUV that you may like or not like but anyone will fall in love with the interior. All seats are comfortable and you have a lot of legroom for rear passengers. Much luggage can be added and you will love the sound system. You can invest a little more to get an even better one than the standard included but you will surely be happy with the standard model. 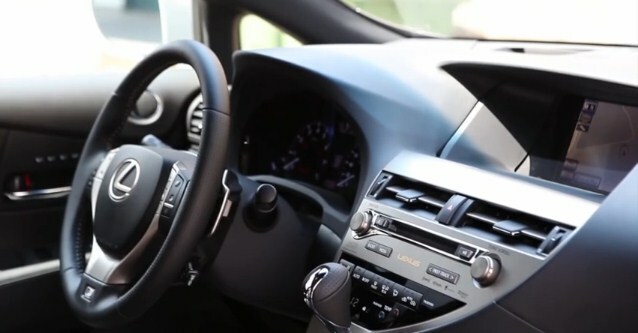 Standard features include a 9 speaker system, satellite radio, push-button start, USB port and Bluetooth. As optional, we have to mention the rearview camera, HD radio, rear parking sensors, front parking sensors, 15 speaker systems by Mark Levinson, pre-collision warning and rear seat entertainment. You even get the possibility of installing blind spot monitoring, which we all know is really good. Lexus RX 350 F Sport 2014 is an SUV that you will most likely love. It is highly subjective to recommend it or not but according to our point of view, the vehicle is definitely among the best in its class. Price tags are good and what you get for what you pay is impressive. PreviousAudi Q5 2014 VS BMW X3 2014 – What Should You Choose?